Floral, fresh, and deeply aromatic – an organic London Dry gin inspired by Kew Gardens. This extraordinary distillation uses over 20 botanicals, including Riverford grapefruit, lemons, limes and rosemary. The flavour is unique: a very crisp, fruity first hit of cucumber, followed by subtly spicy herbal notes. 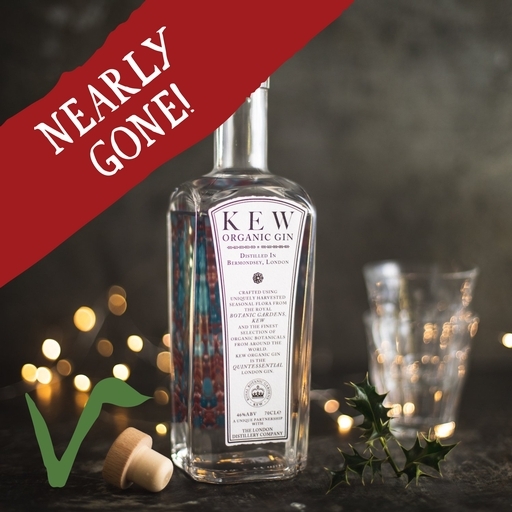 In its striking box and bottle, Kew’s gin makes a very fine gift for any gin lover. In an old Victorian dairy cold room, a short walk from Tower Bridge, live The London Distillery Company’s three stills – each creating a distinct type of spirit. TLDC offer distinctly British tipples with a twist; in this case, a unique partnership with The Royal Botanical Gardens to create a gin that celebrates the gardens’ diversity and abundance. Distilled in a traditional copper pot affectionately known as Christina, it’s a real show-stopper.